As my taxi drove me from Milan Linate airport into the city it was involved in a road traffic accident. As we were driving along dual carriageway in the rain, in the dark, and while my driver fiddled with his TomTom, a bloody great juggernaut beside us suddenly swung into our lane hitting the car on the wing in front of me. There was a horrible crunching noise as the car lurched abruptly to the left and smacked into the central reservation. Again there was a racket as bits fell off and the car again lurched towards the lorry. Thankfully the taxi driver slowed and we missed it but there was no way the taxi was going anywhere and he pulled onto the emergency lane and called another driver who got me to Milan. 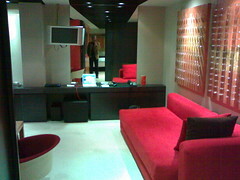 Next thing was my hotel room which reminded me that too much design can be a bad thing. It was like sleeping in someone's office, lots of hard surfaces and mirrors everywhere and everything from light switches to taps was non standard and confusing. Getting up in the middle of the night to go to the loo was much more stressful than it should have been! Lastly I have just heard that my flight back to Heathrow has been cancelled and though they didn't say it was because of the snow I am not convinced the replacement flight will fare any better. Thankfully the gig seems to have gone well and it has been great to see Paolo again!